Big Ten Network, is a cable TV network which is a joint venture between Fox Cable Networks and the Big Ten Conference. It is fully dedicated to covering this prestigious college sports conference. Today, May 31, it announced that it was rebranding. From now on, it will primarily refer to itself by its initials, BTN. The website will be moved from www.bigtennetwork.com to www.btn.com. According to a press release, viewers will see the changes in July. The previous logo for the Big Ten Network has been used since the network launched in August 2007. It was unveiled almost a year before the launch, on October 12, 2006. It featured eleven stars for the eleven schools that made up the Big Ten Conference. The new logo is more flexible than the previous one, which has allowed the creation of specific logos for all twelve participating universities. In Poland, the launch of digital terrestrial television has meant that the four analogue commercial channels (Polsat, TVN, TV4 and TV Puls) have each been given a bonus channel in the digital network. Some have used this space make a cable channel available to all, while others have launched completely new channels. One of the new channels is TV6, also referred to as Szóstka, which targets young people. It is a sister channel to the established TV4. It launched yesterday, May 30, with a schedule packaed with American primetime gameshows such as America's Got Talent, American Idol and So You Think You Can Dance, with apathetic Polish dubbing, of course. Noatum is company which operates maritime terminals and provides port operations and services in Spain. Until recently it was known as Dragados Servicios Portuarios y Logísticos and was a part of the Spanish ACS group. Late last year it was sold to institutional investors, which created a need for a new corporate identity. The namechange was announced in early February, and last Friday, May 27, Noatum unveiled its new corporate identity. It was created by The Brand Union. The company claims the name Noatum comes from Norse mythology and means "towns of ships". The name should be evocative and inspiring. The symbol is created from three pieces that seem to spin around one centric point which "conceptually expresses the logistical process on which the company's activites pivot". It also also evokes flexibility and a maritime heritage. International Forest Products, which trades as Interfor, is a producer of wood and other forestry products in the Pacific Nortwest, based in Vancouver, Canada. Yesterday, May 30, it unveiled a new corporate identity. It was created by FLIR Creative from Bellingham, Washington State. The new logo contains a "graphically powerful image", which is a stylized tree in two colors, symbolizing trees, unity and strength. The name written in a "strong typographical font", which we recognize as the Gotham typeface, a.k.a. the Obama font. It will replace both the previous corporate logo and product brand in the United States and Canada, such as Interfor Pacific, Adams Lake, Acron and Cedarprime. American network television is a competitive business, and all the current four big networks (NBC, CBS, ABC, and Fox) have at some time been able to claim to be the most watched network. This has not been the case in Canada, where CTV has been the dominant English-language commercial network for a long time. The second largest privately-owned network is Global, while smaller networks like CH, /A\ and Citytv have been of less importance. Today, May 30, it was announced that one of those networks, the /A\ network, will be swallowed by a new network which will called CTV Two, taking its name from the market leader. The logo for the new network, the word two in red lower case letters with the well-recognized CTV logo, was also unveiled today. The schedule for the network will be unveiled on Thursday, June 2. /A\ and CTV have belonged to the same company since 2006. Welcoop is a company which provides support, counseling and services to French pharmacies. Recently, it introduced a new corporate identity, created by Saguez & Partners, who also created the recent Sanofi rebrand. The new logo contains a profile of a human head, with a rainbow in place of the brain. The new look has been implemented with similar logos for Welcoop's different sub-brands for professionals and consumers. Bank Rossiyskiy Kapital, or Банк Российский Капитал with cyrillic letters, is a Russian commercial bank, founded in 1993. Recently, it announced that it was rebranding with a new look, created by the Moscow design agency Direct Design Visual Branding. It should reflect "reliablity, openness and active leadership". Like the previous logo, the new one includes an icon which combines the initials Р and К, but the new version is more modern and elegant. The Russian flag colours are replaced with a red, orange and grey. A press release which includes a mention of the rebranding was issued on April 28. Bank signs should have been replaced during the month of May, and the rebrand should be completed during 2011, including a new website. A1 Telekom Austria is an Austrian telephone company. It was created in 2010 from the merger of mobilkom austria, whose primary brand was A1, and Telekom Austria. Until now, both the A1 and Telekom Austria brands have stayed in use towards consumers, and the company logo has been a combination of the two. The logo for A1 Telekom Austria, which contained the logos for the two consumer brands. Today, May 27, the company revealed a new look A1 brand which will replace both Telekom Austria and the previous A1 brand. The new look should be in stores by mid-June, the official launch is set for June 14. It was created with Saffron Brand Consultants, who also worked on last month's C&A rebranding. The new A1 logo is a three-dimensional and flexible one. In fact, A1 claims this to be the first flexible telco logo in Europe. While the 1 stands solid, upright and unchanged, the A is seen at an angle and can take on different kinds of texture. This texture reflects different topics, for example, an A overgrown with grass can be used when talking about the environment. Below you can see a few variants and what they symbolize. Skynet Asia Airways is a Japanese low-fare airline, which made its first flight in 2002. On May 12, it announced that it would abandon its old boring name for a more exciting one. From July 1, it will be called Solaseed Air. The new name is a play on words which combines the Japanese word "sora", which means sky, and "seed". It should also remind one of the second half of the musical scale, as in Do Re Mi Fa So La Si Do. The brand positioning talks about spreading seeds of smiles, which is reflected in the logo, the pistachio green color and identity applications. The previous logo has been used at least since the airline started flying in 2002. It should be noted that Skynet Asia Airways still be the official company name. Crimea (Крим in Ukrainian) is an autonomous republic in southern Ukraine. It area corresponds to a peninsula of the same name which is located in the Black Sea, mostly separated from the rest of Ukraine. On March 2, an official competition to create a new logo to market the peninsula to tourists. The previous logo was now considered dated and hard to use. Out of 307 received entries, the committee selected seven which would go through more testing with focus groups on April 26. This eliminated four of the entries. The winner of the remaing three was determined yesterday, May 26, at committee meeting, based on "expert opinion". It was created by the Kiev agency iBrand Design Consulting and can be seen above. The slogan in it says "Жемчужина мира", which mean "Pearl of the World", but that was romved in the design presented yester day, so it may perhaps not be a part of the final design. The Royal College of Music, or Kungliga musikhögskolan (KMH), is one of the leading music education institutions in Sweden. On May 5, KMH presented a new visual identity. It was created by Stockholm Design Lab (SDL), who were was selected from seven agencies. The previous identity was developed in 1998. Since then, the college has gone through many changes, and it is also planning for a new building. A need to better communicate the institutions core values and specificity to both domestic and international receivers was identified. Furthermore, the previous identity was mostly developed with print in mind, and was limiting when used for digital applications. From now on, communication will put emphasis on the abbreviation KMH. Unlike the full names, it works in many languages. The visual identity intends to be both formal and playful, and to express creativity and openness. If you know and admire SDL's other work, you should not be disappointed. It follows a familar Scandinavian design philosophy that is unique to this agency. Yesterday I wrote about a rebranded Latvian bank, and today comes another logo change in the Baltics which was presented on the same day. This time it is the port authority in Tallinn, the capital of Estonia, which unveiled a new logo on Monday, May 23. According to the port authority, the previous logo had been used for over decade, and it was considered dated and in the need for modernisation. Its old slogan, "The port that ships love", was included in the logo, which was also reflected in the form of a red heart over the I. The typeface was Eras Ultra, which was very popular in the 1990s, but is a bit frowned upon today. The new identity was developed by a well established Estonian corporate identity firm called Identity. It abandons the love theme, in favour of a new slogan, "The Port of Good News". The heart gives away for a new orange "smiling anchor" icon. GVT is a Brazilian telecommunications company which offers fast broadband services. Founded in 2000, it was bought by the French media and communications group Vivendi a few years ago. On May 2, it unveiled a new logo, replacing the "swoosh" logo it has used for most of its existance. In the new straightened up mark, the "swoosh" has been replaced by an arch under the T, symbolizing employee and customer satisfaction. The ad agency Loducca has created a campaign to launch the new look, and some sources also credit them with the identity work. Aizkraukles Banka is a Latvian bank, the largest independent private bank in the country. Since its foundation in 1993, it has opened offices in many Eastern European countries. On Monday, May 23, it officially changed its name to ABLV Bank and introduced a new corporate identity, created by The Brand Union. This is part of a strategy adopted in 2008 to turn ABLV Bank into a "leader in banking, wealth management, and financial advisory in the Eastern Europe". Since 2002, the bank has used the marketing name AB.LV, which also happened to be the bank's web address. The previous logo, which came in multiple colours, was also introduced in 2002. The new logo consists of the abbreviation ABLV and a new symbol, which is called "the jewel". The image below shows different versions for light and dark backgrounds, demonstrating the transparency of the symbol. The Polish Ministry of Economy, Ministerstwo Gospodarki, has a new visual identity, as revealed on May 19 at a press conference. It was created over several months by the Warsaw agency Mamastudio and employees of the ministry. It intends to give the ministry a more modern look which represents it better internationally. The main colour is called steel, which stands for tradition, strength and seriousness, while the complementary green colour stands for modernity, innovation and renewable energy. AMP is an Australian financial services company. Recently, it merged with AXA Asia Pacific, and on Friday, May 20, it revealed a new logo which will replace both the former AMP logo and the AXA logo. It was launched through a TV commercial on Sunday, May 22. The "full roll-out" is scheduled for a start in September, and the AXA brand should be completely removed by December 2013. Landor Associates developed the corporate identity, and AMP's ad agency Banjo created an ad to launch the new brand. Instead of looking back to AMP's history, or creating a "compromised blend" of AXA and AMP, the company has selected a completely new identity represent the merged company and a "new chapter in AMP's history". The symbol has been named the "AMP spark" it represents "possibilities" "in the face of life's twists and turns". "Metallic" version of the previous logo, used in advertising. AMP claims that their first "formal" logo was introduced in 1956. It consisted of the initials in a "TV screen". It was used until 1988, when a more corporate and "fast-paced" logo was introduced. An updated version of that one was introduced in 2000, and it is that logo which is being replaced now. The first world's fair was held on London in 1851. Since then, they have been opportunities for countries to display their technological and scientific visions to the world. Nowadays, the biggest world's fairs are called "Universal Exhibition" and are held in years ending with 5 or 0, and "International Exhibitions" are held between the universal ones. The next such Universal Exhibition will be held in Milan in 2015. Today, May 23, it was announced that logo above will be the official logo for the event. The logo was chosen through a competition. A jury lead by Giorgio Armani selected two finalists from more than 700 entries, and then let Internet users vote on which logo should be used. The deadline for voting was yesterday. The finalists were two young designers named Alice Ferrari and Andrea Puppa, born in 1984 and 1981, respectively. Puppa's winning design consists of the word Expo and the year 2015 written together. Ferrari's choice of an egg as main symbol was inspired by the exhibition's theme, which is "Feeding the planet, energy for life". Until now, the logo used for this event has stemmed from Milan's bid to host it. This atrocity combined clip-art images of both the Vitruvian Man and a globe, replacing the letters X and O in the word "expo". On the morning of May 19, Pro France, an organization which seeks to promote products produced locally in France, unveiled a new stamp which can be used by products of certified French origin. The reason this stamp was developed was a perception that the declaration "Made in France" was too vague. The new label, which states Origine France Garantie, comes with clear specifications for its use. Oggu is a new Dutch brand for 100% organic soft drinks without chemicals. The first batch was rolled out to Albert Heijn supermarkets in January this year. It hopes to roll-out to other European markets such as Germany, Belgium, Scandinavia and the UK this year. Organic Beverages, the company behind the organic soft drink, turned to Design Bridge to come with the entire brand, involving everything from naming and strategy to design. Oggu, Design Bridge tells us, is a combination of the words "organic" and "gusto" (Italian for taste). The brand positioning is "For the Love of Delicious Purity", combining the purity of a 100% organic product with indulgence and a slightly unconventional attitude. Design Bridge mentions t-shirt's a one of their inspirations, and the labels and other graphical elements certainly reminds one of elaborate t-shirt printing with words from different European languages in "playful" typefaces. It would be a lost opportunity if the company didn't print up t-shirts based on the labels to be handed out to costumers this summer. SK C&C is a Korean company which provides various mobile communication technology solutions. On May 17, its U.S. subsidiary, SK C&C USA (! 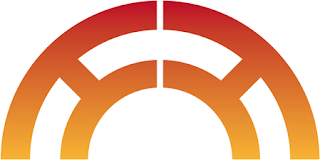 ), unveiled a new brand for mobile commerce solutions, which will now be called CorFire. Discovery Home & Health is an international lifestyle channel brand targeting women. It is owned by Discovery Communications and available in three areas: Latin America, Asia-Pacific and the United Kingdom. Recently, the Latin American version of the channel was rebranded with a new on-air look and a new logo to give the channel a more fresh and contemporary look. The new look was launched on May 3, but promos advertising the rebrand had been running on the channel before that. Discovery Home & Health logo. Used in Latin America 2005-2011. Used in the United Kingdom 2005-2008. Still used in the Asia-Pacific market. The new look is credited to Robert Gibson, creative director for lifestyle and entertainment channels at Discovery Networks Latin America in Miami. An image posted by Discovery Home & Health showing the new on-air look. Discovery Home & Health in Latin America uses a schedule made up of theme nights; health on Mondays, relationships on Tuesdays, beauty on Wednesdays, home on Thursdays and family on Fridays. The new graphics embrace this by using different images related to these themes, as seen above. Two Heavens Creation is a collaboration project which seeks to promote cultural collaboration between Austria and China. It was created last year by an agreement between China Heaven Creation International Performing Arts from China and Wien Holding and Wiener Stadthalle Betriebs- und Veranstaltungs from Austria. The logo for this project was created by Pentagram in Berlin by Justus Oehler and his team. The symbol represents the project through letters and symbolism. Two letters H (for "Heaven") lean over to form a bridge (probably representing cooperation). The bridge can also be read as a C, for creation. A "sunburst" gradient goes from red (present in the flags of Austria and China) to yellow. The symbol on its own. I don't know when this was launched. Pentagram's case study was published on April 27, but it is possible that the identity was launched well before that. Proffice is a human resources solutions company in the Nordic countries. Originally a Swedish company, it was founded in 1960. In the late 1990s in expanded to Norway, Denmark and Finland through aquisitions and new establishments. On April 4, Proffice launched a new strategic agenda to create a more united concern, intending to radically increase turnover. This strategy included a new brand strategy and corporate identity. This agenda includes strengthening the company's specialist brand Dfind. Some business areas involving specialists that used to be Proffice-branded now use the Dfind name. Proffice and Dfind have both been given new and consistent logos. I don't have any source for this, but I would guess the blue and yellow pieces represent the missing links that Proffice provides to an organisation. The previous Proffice identity had been used for a relatively long time, since at least the 1990s. Located in the Western part of New York near the Canadian border, Buffalo is the second largest city in the state. The metro area has more than 1,1 million inhabitants. The city has been the site of several events in U.S. history, although it has become less important druing the 20th century. The majestic Niagara Falls are located in the area. Recently, on May 10, the Buffalo Niagara Convention & Visitors Bureau unveiled a new logo to market the region with a new slogan, "Buffalo. For Real.". Several creative professionals from the area collaborated in developing the brand positioning and its implementation. The development took "more than a year", and it seems it was almost entirely done without compensation to those involved. HSMAI stands for Hospitality Sales and Marketing Association International, an international organization which promotes the hospitality industry (hotels, travel, recreation etcetera). Yesterday, May 11, it revealed a new logo. This article was originally published on May 12, but seems to have moved to May 17 after the Blogger crash. Today, May 12, TeliaSonera, the incumbent telecommunication company in Sweden and Finland, launched of a new corporate identity. The identity was created by Landor. It has been used in several Eurasian markets since 2009, but this brings the identity to the corporate level and implements it on consumers brands in the Nordic and Baltic coutries. The new identity has purple as its signature colour. It should be modern, warm and lively. 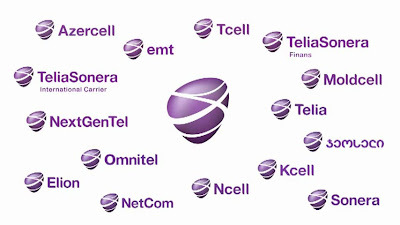 It also distinguishes TeliaSonera from other mutlinational telecom corporations. The new mark is a pebble with white lines, a symbol for "trust, reliability and strength". 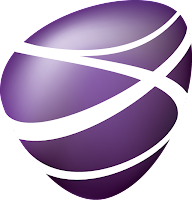 TeliaSonera was formed in 2002 from the merger of Telia from Sweden and Sonera from Finland. Both companies where created around 1993 when former government monopolies where turned into limited companies (Sonera was known as Telecom Finland in its early years). The governments of Sweden and Finland still maintain high ownership stakes in the companies. When the companies merged in 2002, a simple wordmark was created as a corporate logo. All consumer-facing brands maintained their previous looks and identities without any reference to the parent company. The new corporate identity means most brand logos are replaced by generic ones with the new symbol, although the individual names will remain. The new look was launched for several of the company's assets in the Nordics and the Baltics simulatenously with the corporate brand. Many assets in emerging markets outside those areas have already used the new symbol for some time. TeliaSonera claims it to be 18 different brands that have united under one common identity. Finally, there's Ucell in Uzbekistan, who will get the new look in June.